Super-Fast magazine deployment via its open-ended pouch design. Compact size, yet carries 8 fully loaded M-16 / AR-15, 30 round magazines. Lightweight and comfortable. Designed to be worn over body armor the M.O.U.T. Rig has narrower, fully adjustable straps that eliminates bulky pouch flaps and unnecessary hardware reducing overall weight without compromising durability. Secure magazine carry due to its set of SPEC.-OPS. Brand "Dura-Lastic" compression and quick release top straps. Dura-Lastic is Spec-Ops proprietary blend of Cordura fiber and Natural Rubber resulting in the most durable elastic ever. Outlasts even the toughest Bungee cord! Extra gear storage via the front mounted "Dura-Lastic" compression straps; perfect for lights, glow-sticks, pens, etc. Also allows for the attachment of M.O.L.L.E. / PALS / X-System pouches to these loops. Easy on, easy off, 4 Quick- release points for rapid removal. Eliminates excessive bouncing / flopping around when roping in / running. 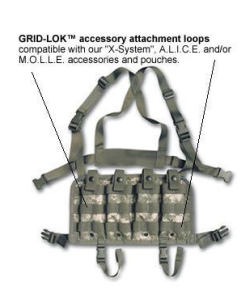 This is accomplished by means of the fully adjustable harness and set of 2 frontally mounted stabilizer straps that loop around belts, or through M.O.L.L.E. type loops on body armor.